Combine flour, milk powder, salt and baking powder. Sift and set aside. Cream butter and sugar until fluffy. Add egg and mix until blended. Mix in blended seaweed and sesame seeds with a spatula. Add flour mixture. Use spatula to mix and press to form a dough. Wrap dough in plastic wrap. Chill dough in the fridge to harden so it’s easier to handle. When ready, lightly dust work surface with flour, roll out dough to 5mm thickness and cut with cookie cutter (dust cutter with flour to prevent sticking). 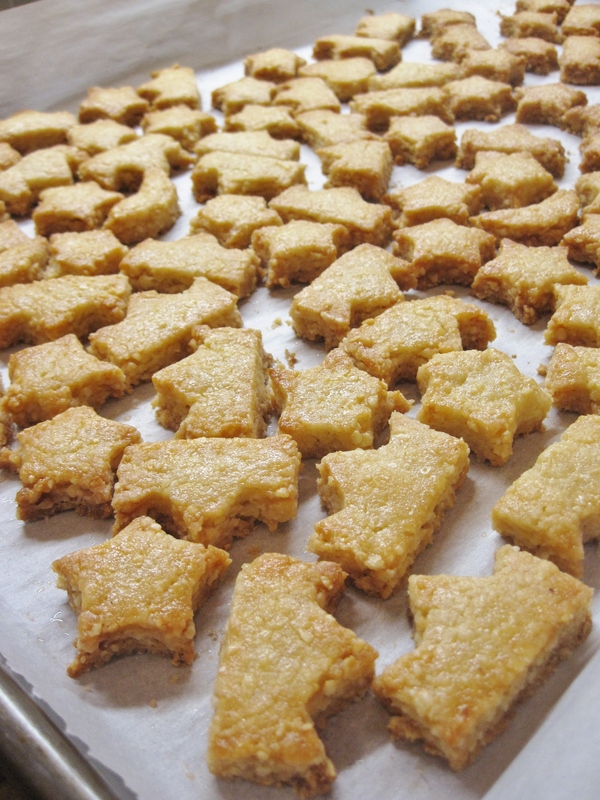 Put cut cookies on baking pan lined with parchment paper. Brush with egg wash then dash the top with chili powder. Bake at preheated 325 F oven for 15-20 minutes or until golden brown. Cool cookies on a rack. Store in air tight container when completely cooled. 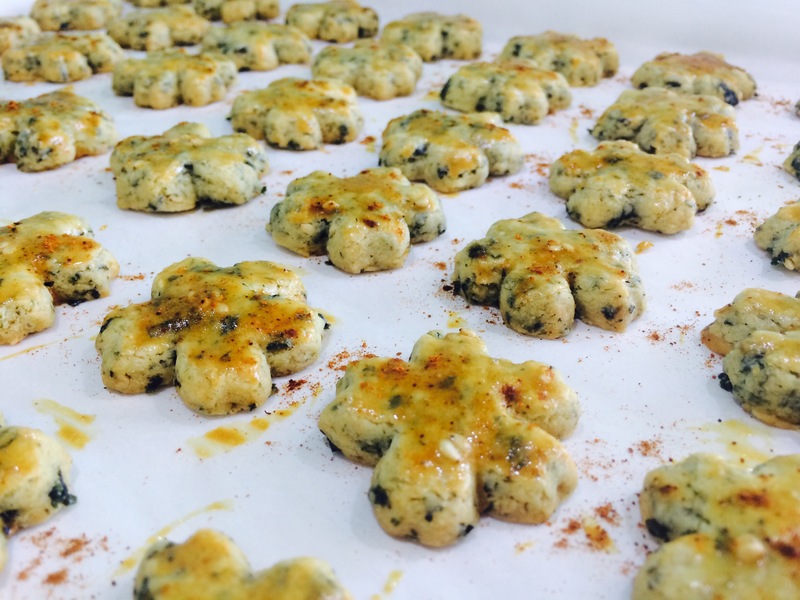 Seaweed: I used snacking seaweed instead nori for sushi making– snacking seaweed is usually lightly seasoned with salt and oil, making the cookies more flavorful. Today is Chinese New Year’s Eve, it is the day every Chinese household cook up a storm, starting early in the morning~ in my family back in Malaysia, we will be busy cooking foods to offer to our ancestors in the other world, and this usually happen around lunch time. By the evening, we will be busy making the most important meal of the year– reunion dinner. Family members will always rush home from around the places to join the table. If you are not familiar with Chinese culture, let me tell you: Reunion dinner is a FEAST not to miss!Fish, shellfish, soup, pork, chicken, duck, veggie are usually on the menu. Oh how I wish we could join the dinner with my family on the other side of the planet… I have my feast too spreading out on my dining table here at home, but the feeling is not the same. Anyhow, back to the cookies. This is another new cookie recipe I tried this year for my Chinese New Year bake, and I don’t really know why it is called German Cookies. Maybe it is similar to one of the Christmas cookies German make for the holiday?… Anyway, one interesting ingredient to this cookies is potato starch, which I believe is the key to these very light, airy and melt-in-your-mouth cookies. Not only is the recipe super easy and fun to make with little kids, the cookie dough freezes well too. Some people make their version with a marble look(chocolate and original flavor), doggy look (by using some cereal to make doggy face). Others use poppy seeds. This time, I used black sesame seeds so the cookies don’t look so plain and pale, plus I like the nutty flavor of toasted black seeds. Green tea or earl grey will be good choice for a different look and flavor as well. 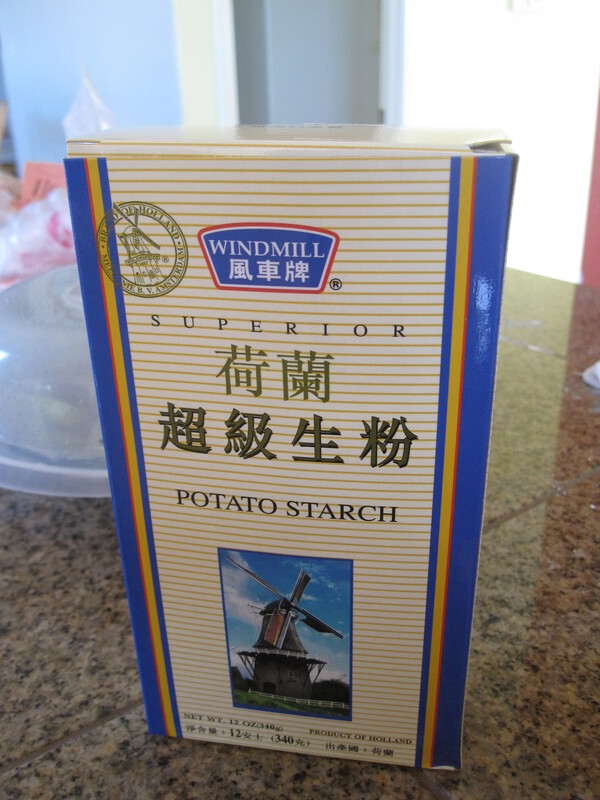 Combine flour, potato starch and milk powder together in a bowl. Put butter in a separate bowl. The butter must be very soft but not melted; microwave for a few seconds if needed. Add powder sugar and mix well. Add in sesame seeds to mix well again. Sift flour mixture into butter, mix to form a soft dough that is not sticky to the hands. If the dough is too soft, refregerate for 10-15 minutes. Take a small piece of dough and roll into a ball of 1-inch size. Repeat until all the dough is used. Place each ball one a large baking pan, about 1 inch apart. Press each ball down slowly with a fork to make a pattern. Bake at preheated 325F oven for 15-20 minutes, or until the edge is slightly brown. Cool completely then store in air tight container. Freezing cookie dough: roll up dough to a log shape and wrap in parchment paper followed by plastic wrap. Place in air tight bag. To toast sesame seeds: toast in dry clean pan on the stove on medium low heat, stirring at all time until the seeds puff up a little and sesame flavor starts to come out. Cool before use. With Chinese New Year getting closer and closer, I have been baking like crazy~ pretty much bake one type of cookies a day on top of my normal busy routine around the house. 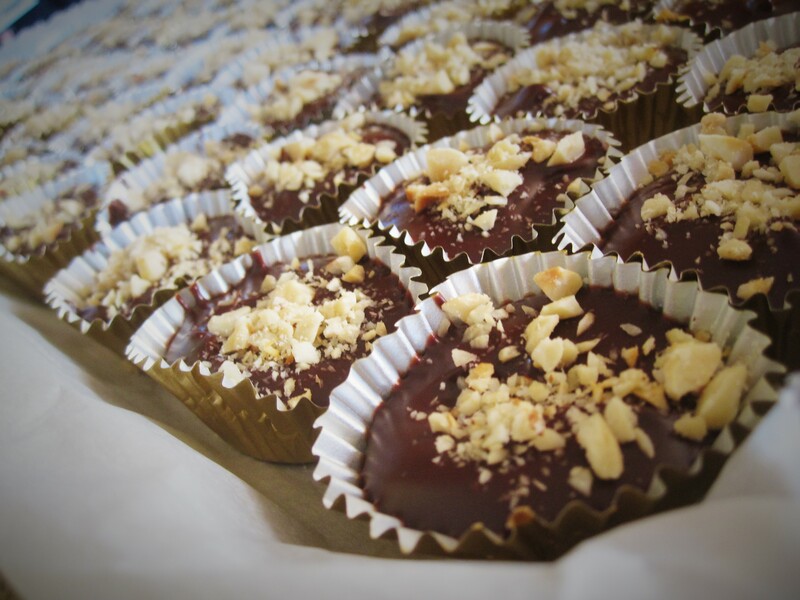 These hazelnut chocolate mini cuppies are new cookies that I tried making this year. I love hazelnut, and chocolate makes it even better! 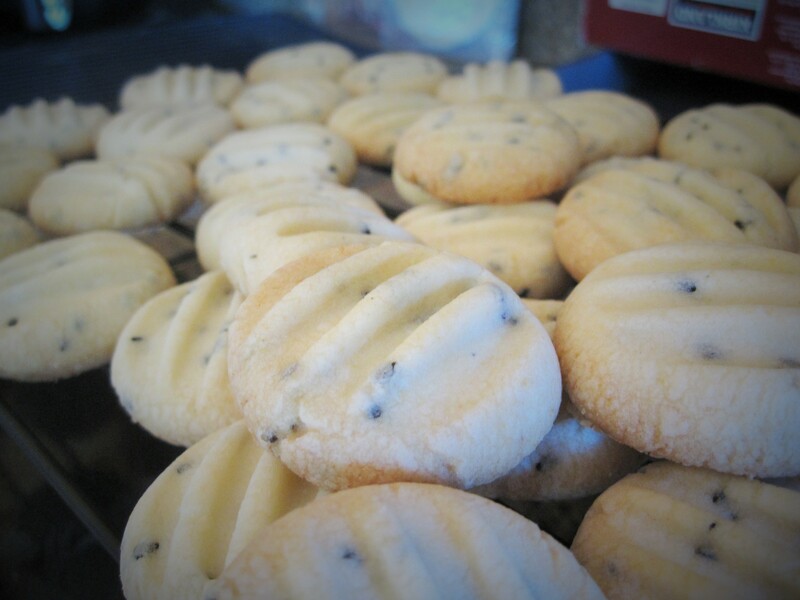 This is a very simple recipe that produce yummy cookies. From my previous trip back to Malaysia, I brought with me these mini baking cup liners which is perfect for these cookies. For those who are not familiar with Chinese New Year cookies (a New Year tradition among Malaysian and Singapore Chinese), they are usually made in bite size and have a delicate look. If you are making these cookies, go elegant with the look~ make the cookies small and pretty just like from a chocolate shop. It worth the efforts. Combine flour, ground hazelnut, powdered sugar and salt in a bowl. Place butter in a separate large bowl, gradually pour in flour mixture while using fingers to rub in butter, until it forms a dough and doesn’t stick to hands. If the dough is too soft to handle, refrigerate for 10-15 minutes. Divide dough into small pieces (about 8g each) and roll each piece into a balls, about size of a marble ball. 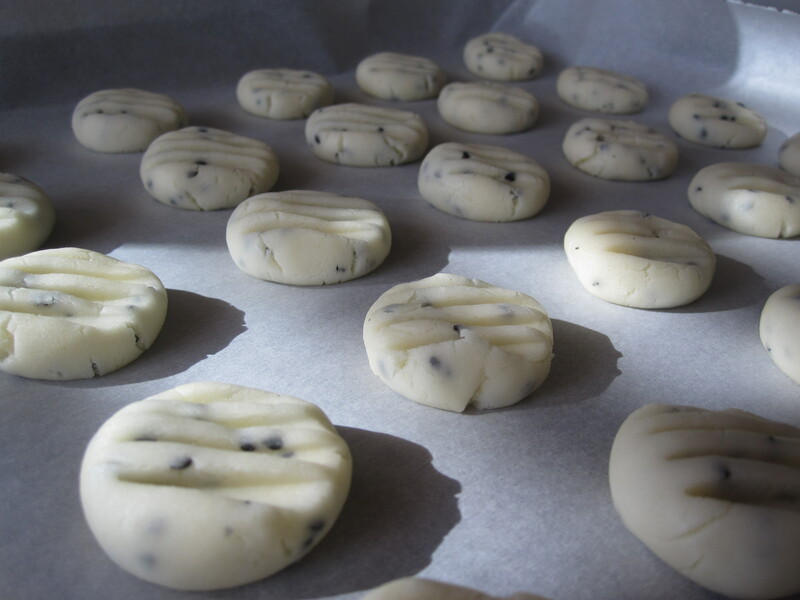 Place each ball in the baking cup and press down with your thumb or finger to form a disc. Bake at preheated 325F oven for 15-18 minutes or until the top is slightly brown. 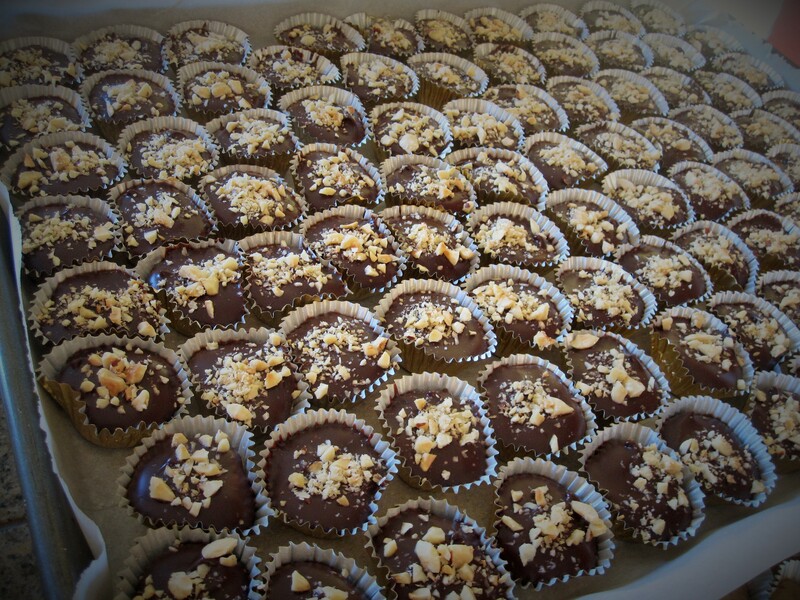 When the cookies are cooled completely, carefully cover the top with about 1/2 tsp of chocolate sauce. 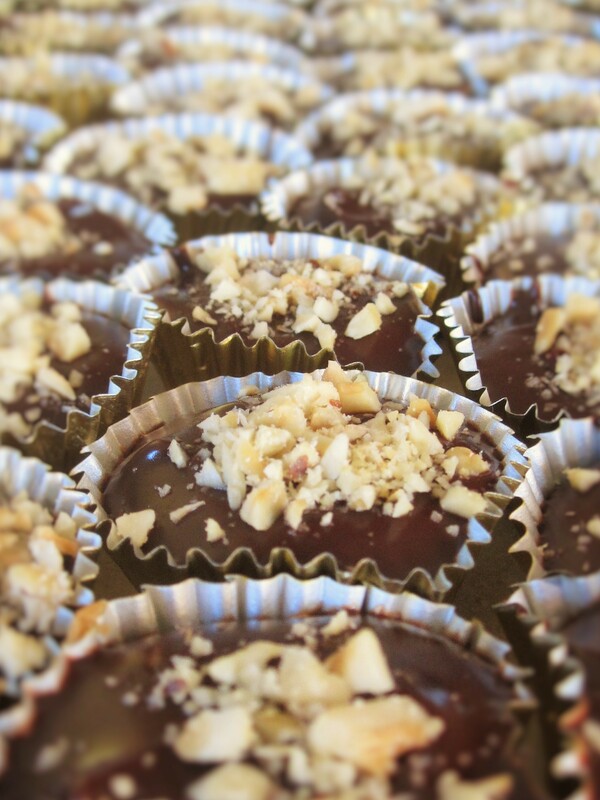 Sprinkle some chopped toasted hazelnut on the top. When the chocolate is set, store in air tight container. Chocolate sauce: if the chocolate cools down and thicken, just warm it up again over a low heat simmering pot. Freezing cookie dough: to freeze cookie dough, wrap tightly in a parchment paper (shape like a sushi roll), then wrap in plastic wrap and inside an air tight bag.